It has been a crazy busy month and here I am mulling over my next month's Program Plans. I have a few things I like to stock up on every Spring because they are easily available to collect or buy. This is the time to start Spring projects, like planting grass seed in a soil filled knee high stocking. It leads into my Very Hungry Caterpillar theme, and we can trim the spiky grass in a few short weeks. 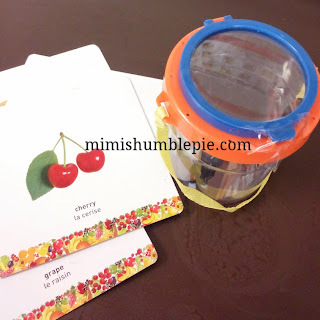 I stock up on the jumbo peek a boo bug jars from the dollar store (the ones with the magnifier in the lid) and use those all year long for a variety of activities. Another theme on my mind is, Mother's Day, it's time to get any projects underway so they are ready to go home. Here is one of my go-to parent gift posts using mini canvases from the dollar store. I would love to know what your favourite Spring items are, and what special activities you plan for Spring!